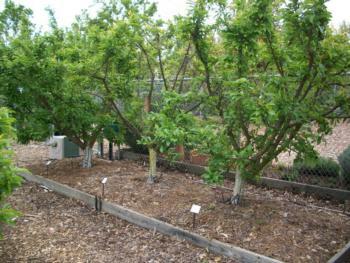 The Fair Oaks Horticulture Center orchard was established in 1998 to demonstrate planting and pruning techniques for fruit trees that are appropriate for small urban yards. The orchard displays many ways to maximize the number of fruit varieties that can be planted in a small space for a long harvest period. The original trees in this orchard were planted in 1998, although many have been removed and replaced. These changes have been a learning experience for both the Master Gardeners and the public! Replacement trees have provided an opportunity to demonstrate the planting and training of young trees, and to taste new varieties. 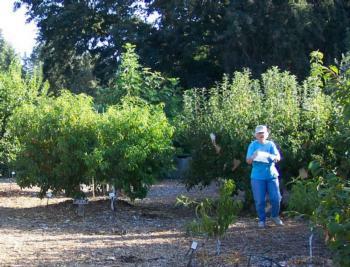 Also visit the Home Orchard page at left for general fruit tree growing information. 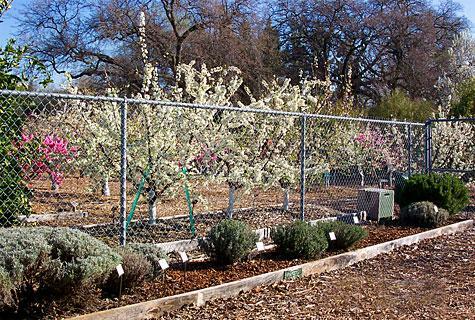 The Fair Oaks Horticulture Center orchard shows many different ways to plant and maintain fruit trees to maximize fruit production. Visit the orchard during a workshop, on an open garden day, or for Harvest Day and see for yourself how you can successfully grow and enjoy a wide variety of delicious fruit right from your own trees. Read more about growing fruit bushes. Each tree has half the space to grow in that a single tree would have. Each tree takes up one third the space of a single tree. The planting mound was created to improve drainage over an area of hardpan. Note that many of the tree trunks and exposed limbs are painted white to prevent sunburn. The paint is a mixture of 50% white (or light colored) interior latex paint and 50% water. Each tree takes up one fourth the space of a single tree. Originally, eight trees were planted two feet apart in a hedgerow. We found this planting much too close and removed the entire row. We planted three new pluot trees five feet apart. We installed a raised bed to allow for better drainage. From our experience, trees planted in a hedgerow need to be planted at least five to six feet apart. Espaliers are useful where you have a narrow space, such as along a fence or house. 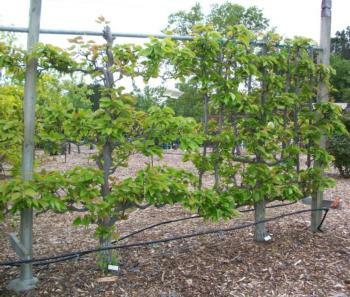 Shoots can be trained along wires or spread out in a fan shape, with fruiting spurs carefully selected and maintained. 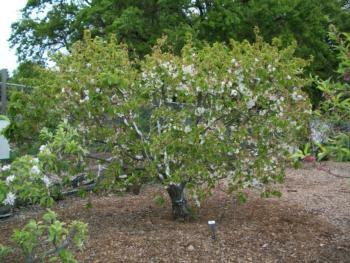 Apples, pears, and citrus have traditionally been espaliered. 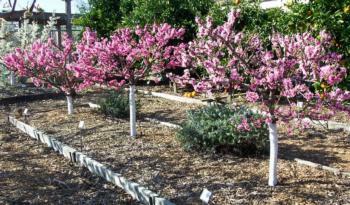 Our orchard includes espaliered apples, pears, Asian pears, and a dwarf pomegranate. 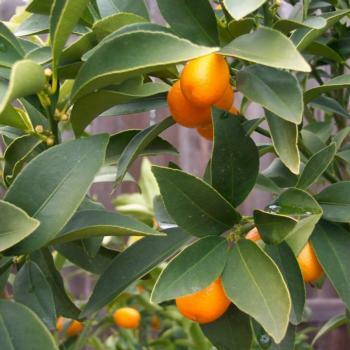 With little pruning, genetic dwarf citrus trees will grow no more than 8-10 feet tall and wide – this is about half the size of a standard sized citrus tree. With some additional pruning, these dwarfs can be kept smaller. 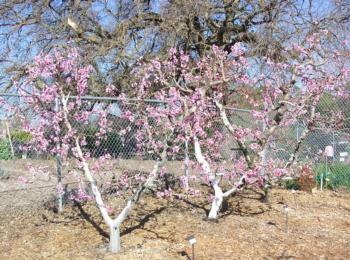 This is a row of three mature genetic dwarf peaches and nectarines, yet they are only about 5 feet tall. The fruit from these trees is very tasty! 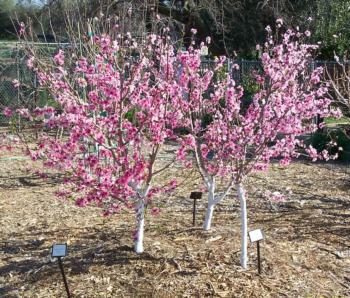 In this row of peach and nectarine trees each tree has only two main scaffold branches forming a “V” perpendicular to the row, and trees are planted only 5-6 feet apart. Our trees are allowed to grow up to 8-10 feet, and DO require the use of a ladder. See more about perpendicular V training. 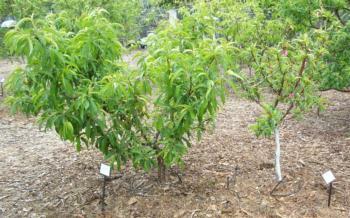 This special cherry tree has six cherry varieties grafted onto a Lapins cherry tree. Most cherry varieties need a second cherry tree to cross pollinate, but not here. 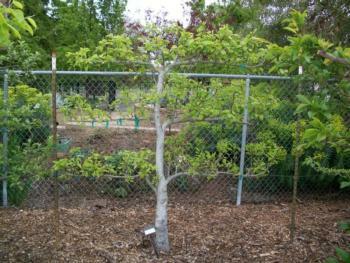 A tree like this is a good reason to learn bud grafting, or buy a multi-variety grafted tree! 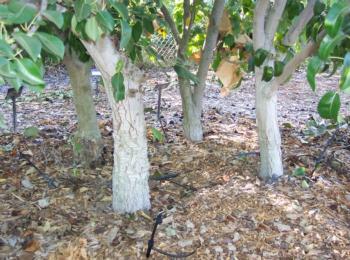 It takes an artistic eye, but a tree can be trained to special shapes - this is an Asian pear espaliered arborsculpture. Notice the menorah on the right! 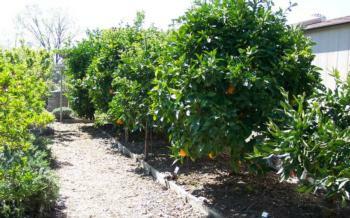 Fruit trees with attractive fruit can be a special feature in a landscape or just a color highlight. Good choices are citrus, persimmon, or pomegranate. 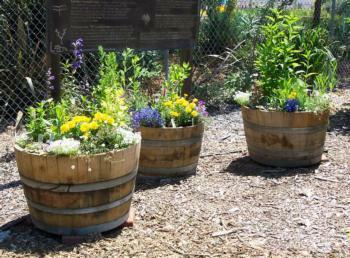 Here are some half wine barrels planted with landscape plants that attract beneficial insects to the garden. Some beneficial insects help pollinate fruit trees; others help kill or control “bad bugs” in the yard. For more in-depth information about the various planting schemes and training methods described above, take a tour of the Orchard. Go to the Home Orchard resource page for links to general orchard fruit information.